2015 Subaru Legacy Pros and Cons: Why (Not) This Car? Buyers of somewhat affordable midsize sedans who desire all-wheel-drive but whose tastes aren't overwhelmingly Accordish have a few others to choose among: the Ford Fusion, Chrysler 200, and Buick Regal. These three sedans, with their European connections and relatively tight rear seats, are much more similar to one another than any of them is to the Subaru Legacy. Which one should take point? Probably the Ford as it's among the segment's sales leaders. But I'm volunteering the Chrysler because it's also new for 2015 and, like the Legacy, is offered with a six-cylinder engine rather than a turbocharged four-cylinder. Interior about as exciting as the exterior, but well-constructed with a quality look and feel. Why the 2015 Subaru Legacy? With some cars, all-wheel-drive is about performance at least as much as safety. The Subaru WRX is one such car. The Subaru Legacy GT used to be another. But the Legacy GT stopped being much fun to drive with the 2010 redesign, so it came as no surprise when the variant was dropped after the 2012 model year. Driving fun hasn't returned to the Legacy in name or spirit with the 2015 updates. Even the six-pot engine doesn't feel especially strong, the steering communicates little, and the Goodyear Eagle LS tires give up well short of the limits of the otherwise well-behaved suspension. Any of the Detroit 3 competitors can be more entertaining on a curvy road. Better yet, if you don't need the interior space of a midsize sedan, but do want to enjoy your time behind the wheel, opt for something more compact. By process of elimination, every Subaru Legacy comes with all-wheel-drive (AWD) standard as a safety feature. I don't want to overstress the benefits of AWD. Tire type has a larger impact on cornering and braking, both of which are more essential to safety than reducing the odds of getting stuck in deep snow. This said, AWD can enhance the stability of a car's handling, and the Legacy's system definitely does. Acceleration and engine braking both act upon all four wheels, so getting on or off the gas mid-turn has less, even much less of an effect on the attitude of the chassis than it does in a FWD or RWD car. (The latter sort can be especially tricky.) Very little upsets the composure of the Subaru. I especially appreciated this when driving through a torrential downpour on the twisty Blue Ridge Parkway. I didn't have the chance to drive the competitors in the same conditions. But in general their on-demand systems don't drive all four wheels as continuously as the Subaru's, so their bad weather handling might not be quite as steady. Beyond the Legacy's ultra-safe handling, Subaru will soon offer an updated version of its EyeSight system as option. This system, which detects when a collision is probable and can automatically brake the car if the driver does not respond to the initial warning, has proven highly effective in tests. Within the segment, only the 2015 Hyundai Sonata offers something similar. The EyeSight system, which also includes adaptive cruise control and lane departure warning, is bargain priced at $795 ($1,195 on the mid-level Premium, where it also adds a blind spot warning system). A caveat on this price: on the Limited trims you must also get the $2,195 moonroof and nav package to get EyeSight. If a collision occurs anyway, the 2015 Legacy should protect its occupants very well, judging by the crash test scores of other recently revised Subarus. The 2014 Legacy performed well in all crash tests aside from the recently added small overlap test, and I have little doubt that the 2015 updates addressed this shortcoming. In the Chrysler 200 and especially the Ford Fusion you sit relatively low behind a deep instrument panel. To the rear, a coupe-like roof line pinches outward visibility. Much like the Honda Accord, the Subaru Legacy is more practically proportioned. You sit higher relative to a shallower instrument panel, and the windows are large and relatively upright. This enhances driver confidence and safety. The Buick Regal splits the difference between these two groups. A minor offense: the side window outline is faked via an applique aft of the door. Most of the controls are easy to reach and operate. But a few aspects of the nav system need work. Along with the Honda Accord, Hyundai Sonata, and Volkswagen Passat, the Subaru Legacy has one of the roomiest rear seats in the segment. Rear seat passengers have a couple inches less knee room in the Ford Fusion. The rear seats in the Chrysler and Buick are tighter still. This said, especially with the optional sunroof rear seat headroom is somewhat limited. People taller than six feet might come into contact with the headliner. The top trim level includes rear air vents. Personally, I like the Euro-taut suspension tuning of the Buick Regal GS, Chrysler 200S, and Ford Fusion. You might prefer something cushier, like the Legacy. Even though the Legacy's suspension isn't as tight as the others, it still controls body motions well. For those not seeking a sporty driving experience this tuning (like the Honda Accord's) strikes an excellent balance between ride and handling. The suspension gets an assist from a body structure that feels as solidly constructed as the segment's best. When the body structure doesn't flex over bumps, the suspension can be more compliant without sacrificing precision. Going down the road the Legacy has the feel of a quality car. Noise levels are low, partly thanks to the Goodyear Eagle LS tires criticized earlier for their lack of grip. Such is the way of trade-offs. The Buick, Chrysler, and Ford are also quiet cars, but with more road noise on some surfaces in variants with performance-oriented tires. The Accord suffers from more road noise regardless of tires, if less so than past Accords. If you don't need a powerful engine, but do want all-wheel-drive, then the $22,490 Legacy 2.5i is easily the least expensive option in the midsize sedan segment. For 2015, Ford is making AWD optional on the mid-level SE as well as the top-level Titanium, but still only with the 240-horsepower 2.0T engine and a starting price $6,755 higher than the Subaru's. A Chrysler 200S with AWD lists for a few hundred dollars more than the Ford. Need more than 175 horsepower, but few other options? Then the tables turn. The 256-horsepower 3.6-liter H6 engine is only offered in top-level Limited trim, with a base price of $30,390, $1,145 more than the Fusion and $700 more than the 200S. But the Subaru has additional standard equipment worth about $2,000. Only two options will be available on the Legacy Limited, a $2,195 moonroof, nav, and keyless entry package and the $795 Eyesight system discussed in the Safety section. The tested car had the former. The latter won't be available initially. Equip a 2015 Ford Fusion SE like the tested car, and it lists for $2,240 more. Feature differences account for about $1,000 of this. The story is much the same when comparing the Legacy 3.6R to the Chrysler 200, except that the difference in list prices is even larger, at least $3,275. Feature differences account for about half of this, still leaving the Subaru with a significant pricing advantage. The picture gets a little murkier if you compare a Subaru Legacy 3.6R with both option packages to the loaded, luxury-oriented Chrysler 200C. The 200C costs a few hundred dollars more than the performance-oriented 200S, but can include considerably more content, as only it is offered with a package of electronic safety features. Compared to the Legacy, a loaded 200C lists for $2,790 more, but includes about $3,500 in additional content. If you personally see the value in this additional content, the Chrysler's price might seem a little more reasonable than the Subaru's. But the Legacy's cost will still be much less. Now for the big caveat. Substantial incentives are often available for the Chrysler and the Ford. In contrast, because of their more reasonable pricing and short supply, Subarus have been selling for much closer to their list prices. So while the Legacy's window sticker might be lower, it's out-the-door price could be higher, even much higher. Why Not the 2015 Subaru Legacy? The front seats have an unusually high bulge just below my shoulder blades. This feels more odd than uncomfortable, at least to me. Partly depending on your height your experience might vary. These seats also provide very little lateral support, which admittedly isn't much of an issue given the limited grippiness of the tires. For the most part, the Legacy's controls are easy to reach and operate. There's even a knob to change the audio system channel / station, something of a rarity these days. Still I experienced a couple of issues with the nav system. The touchscreen often didn't respond to taps to zoom in or out. And the voice recognition sytem is so poor that it's virtually useless. Most dangerous of all (to your wallet, at least): the nav system's speed limit indicator was wrong (in one direction or the other) at least as often as it was right. Luckily I learned to ignore it before running through any radar traps or backing up traffic. Plenty of legroom. Headroom in shorter supply, but adequate. This one is highly subjective. Some past Subarus were oddly styled. The new Legacy errs in the other direction: though handsome, it could hardly be more conservative or less distinctive. The new grilles on the new Legacy and new Sonata strongly resemble one another...and that on the Ford Taurus. This clean, conservative styling will appeal to some, even many potential buyers. No doubt Subaru and Hyundai are responding to similar consumer clinic results. And it clearly pays off in outward visibility and interior space. But the exterior shapes of the Fusion and 200 are far sexier. The new Legacy's interior styling is equally clean or generic (depending on one's perspective), but with better materials and a somewhat more upscale ambiance than in last year's car. Acceleration with the 256-horsepower H6 engine is quick enough for any practical purpose, but those seeking thrills could be disappointed. The engine doesn't have much grunt below 4,000 rpm. The 240-horsepower turbocharged Ford feels at least as strong, and the 295-horsepower Chrysler feels considerably stronger. As does the 278-horsepower Honda (which isn't burdened by the additional weight of AWD). I should note that a fair amount of my driving was done on the Blue Ridge Parkway. At high elevations normally aspirated engines like the ones in the Subaru suffer more than turbocharged ones, where boost can partially compensate for the thinness of the atmosphere. Oddly, I was more impressed by the new Legacy's transmission. And mostly by what it didn't do. Until someone asked me how well the CVT performed, I didn't realize that the car's transmission was a CVT (continuously variable transmission). And I had been driving it for a few days at that point. On top of this programming, paddles can be used to manually select one of six fixed gear ratios. I used these often in the mountains to increase engine braking on descents and to manage power through curves. The 175-horsepower 2.5-liter flat four-cylinder engine should perform well enough for most buyers. (I had no issue with it in the Forester.) With this engine, the new Legacy manages impressive EPA fuel economy ratings for an all-wheel-drive vehicle: 26 mpg in the city and 36 mpg on the highway. The 3.6-liter flat six-cylinder engine in the tested car is much thirstier, with EPA ratings of 20 city and 29 highway. The Fusion 2.0T AWD scores better, 22/31. The Chrysler, on the other hand, is the worst of the bunch, 19/29. Unless one includes the 19/27 Regal in the bunch. So the Legacy 3.6R out-economizes two out of three close competitors despite falling far short of the 2.5i. In varied driving in the North Carolina mountains, the trip computer reported an average of 24.6 mpg. In straight highway driving it reported a bit over 30, close to the EPA rating. Manual calculations suggest that these trip computer reports could have been up to two mpg high. I'll finish where I started, with handling. The AWD systems in the Chrysler and Buick are designed to make their handling feel livelier. Getting on the throttle mid-turn helps those cars rotate. For better and for worse, the AWD system in the Subaru has no such effect on the car's cornering. No matter what you do (within reason) the Legacy mildly understeers (plows towards the outside curb). Until you approach the fairly low limits of the front tires. Then it more heavily understeers until the car slows down. This isn't much fun, but it is very safe. Ditto the Legacy's steering. It provides little feedback, but is precise and predictable. The Chrysler 200S's steering is weightier, if also not very communicative. The Ford Fusion steers the best in this bunch. If only the view forward from its driver seat were more open. If you want an all-wheel-drive midsize sedan that is exciting to look at, and perhaps somewhat entertaining to drive, get the Ford Fusion or the Chrysler 200. Unless you want to spend a little more for a more cramped but more thoroughly European car. Then perhaps get the Buick Regal. But maybe your priorities are more practical. If you want a sedan that's solidly constructed, roomy, smooth-riding, and easy to see out of, it's hard to argue against the Honda Accord. Unless you also want the additional traction and handling stability provided by all-wheel-drive. Or the latest safety systems. If you want all of these things, you'll find them in the 2015 Subaru Legacy. Remove the cover, and clearly not a typical engine. As in a Porsche, the pistons move horizontally. The 15.0 cubic foot trunk is just a bit smaller than the segment's largest. Subaru provided an insured Legacy for a week with a tank of gas. The Chrysler 200 was driven at a media association event. 2015 Subaru Legacy pros and cons, according to Michael Karesh: the best reasons for buying (or not buying) the 2015 Subaru Legacy. Join TrueDelta to post your own impressions. The Crosstour is in a different category, since it's taller and has a hatch. New styling that increased the cargo volume would likely increase its sales. I currently drive a 2010 Forester which I like very much. previously i had a 1998 & a 2000 Legacy GT wagon. Wish they still made them. I live in NE ohio & after last winter I will not buy a new car without a heated steering wheel. Subaru does not offer this feature on any of their cars. Now that you mention it, the lack of a heated steering wheel is odd. Excellent point. More and more people are making this feature a priority, and with Subarus most popular in states with cold winters...if I was Subaru I'd add this feature ASAP. Speaking of Legacy, 2015 model is the first one I can "consider". For the average sedan in this class I was impressed by steering, handling, responsiveness of CVT and the fact that on curvy road it behaved well. Only the brake pedal felt mushy as between foot and booster they placed memory foam. Supposedly, this Legacy has fixes for engine, transmission and efficiency issues that previous models suffered from. But I would give Subaru a year to iron these problems. Rear seat [again] has a bit too vertical seat back and a middle person will find no comfort from hard surfaces. Some switchgear on the dash is of lower grade then desired. Heated non-leather seats are nice comfortable up front. The car itself is pretty blend. You will not spot it immediately on the parking lot. 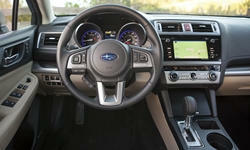 But Subaru filled it with standard and optional features, and fixed previous shortcomings. Sometimes you just want old stuff to remain. Subaru gets + for keeping all-analog instrumentation and a greenhouse, where tall guy doesn't have to scratch his head on the roof liner. And generally, interior interfaces are nice and have real buttons. Remake of CVT is important too. 2014 wouldn't clime over 2 inch curb from the start because of glitch in CVT. Many other CVTs have delay but 2015 Legacy is very responsive. And noise is lower as well. The best feature - there is a lot of value for the money+road handling. If Subaru would replace 17" with beefier 16", the road handling would lose little but ride quality would gain. Also, cost of replacement would be better. On bumpy roads suspension felt a bit busy and thicker rubber might just fixed it. Windows could use some factory tinting. Push-button emergency brake has to go. And manual transmission has to return. If manual was avail I would put it to the top of my list. W/o manual it is not even on the list. Rear seat back should be more back-leaning and center seat should be softer. The fake-metallic inserts on the dash are just pathetic. Brake pedal feel needs immediate attention from the manufacturer. The 3.6 engine also includes a better AWD system than you get in the 4 cylinder car. It includes an actual center differential with an electro-mechanically operated limited slip clutch pack, rather than the no-differential MPT clutch only system on the four cylinder. Static torque split is 45/55 with this VTD system instead of 60/40 with the cheaper MPT system. You also get this better AWD system on WRX CVT models, but not for some reason on the Forester XT. My 2008 Legacy GT also has the VTD system. So I drove the new Legacy 3.6, and found it a big wobbly bag of air. Dear me. Frankly, the interior isn't as nice as the old car either. Fine for driving down the highway mind out of gear, but hardly engaging is how I'd characterize the 3.6 CVT. Just like an Accord or Mazda6 in that these new cars seem numb to me, and the Accord 4 is a bellower when you get on it. The Chrysler 200 AWD with its extremely part-time system that needs a half-second to engage felt ponderous when pushed. The old LGT eats all these for breakfast and is quieter, yes quieter. Where are the fun mid-sizers these days? $20 grand more, I theorize. When Subarus were fun to drive, they didn't sell many. Now that they're essentially Hondas with AWD dealers can't keep them in stock. This isn't my preference, either, but it's apparently reality. For 2015 all Legacies and Outbacks, regardless of engine, have the active torque split center clutch pack. Subaru's information doesn't mention the default torque split. I can report that, even with this system AND brake-based torque vectoring, the car seems to understeer all the time. As you also report, there's nothing sporty about how it handles. @mkaresh - Yes. 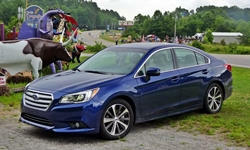 Subaru Legacy is large sedan and it is not going to handle sporty. Its sportiness is relative to its segment. '15 Legacy held the road I blasted pretty well vs Camry and Altima both of which could kill me during same test. Which version of the Camry? I haven't driven the new SE yet, but it should feel sportier. Nissan has gone soft in recent years. They're the new Toyota, but less reliable. A Cadillac CTS-V was considerably larger and heavier, but felt much sportier. A different class of car, to be sure. But large, heavy cars can feel sporty (though not as easily as smaller, lighter ones). Within the segment, the Mazda6 probably drives the sportiest, though as you imply it doesn't feel nearly as agile as the Mazda3. I think it is time for you to review the new 2018 Subaru Legacy 2.5 LTD. The styling has been updated a bit from the 2015-17 models, and as an owner of a 2017 model I have found the CVT drives almost like an automatic without a CVT. The handling is impeccable, and the safety features (Eyesight, rear view camera, etc. are exceptional. While you might not care for the styling, I happen to like the "old" Volvoesque look to the car, combining safety, practicality, and a safe driving experience.